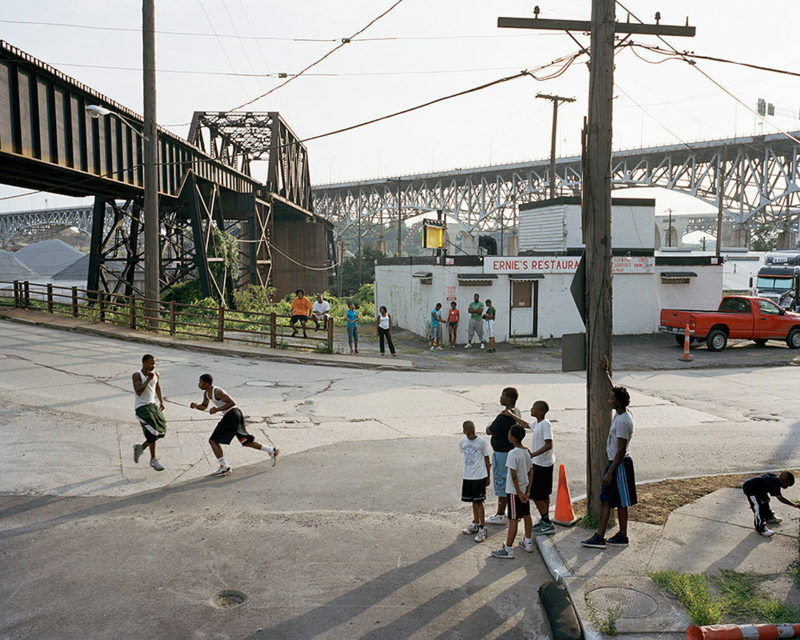 For the past couple of weeks, I have come to this photograph, Riverfront, by Curran Hatleberg. I’ve been trying to find out what actually intrigued me about it. Most likely, it’s a combination of factors. For a start, Riverfront is one of those photographs that is very smartly constructed. It’s complex without it being complex for complexity’s sake. It’s smart, without it being self-consciously smart (like, for example, so much of that “new formalism”/”triangle art” photography: I can’t escape the feeling it’s too satisfied with its own cleverness). It’s a contemporary photograph that, at the same time, feels like a classic; or maybe I should say it references the medium’s history without being nostalgic. The old ideas of form and content are particularly relevant in this case, I think. So let’s see how this works. Well, first of all, the image plane appears to consist of two parts, the foreground and the background. The road that runs from the right to the left (or vice versa) separates the two. I view the foreground as a bit of a stage, with the various actors, two or three groups, depending on how you want to count them. There are the two men on the left who are engaged in what looks like a mock fight of sorts. They’re caught mid-motion, one is about a foot off the ground. The second group consists of five young men/children watching the former, on the right. There also is a child at the very right of the frame who is looking at something completely different – you can think of this as a third “group.” Whatever that child is looking at is outside of the frame — thus reminding the viewer of the fact that photography captures a part of the world, and we have no way of knowing what lies beyond. In the background, there is a group of young women and men watching the scene. You could split them up into groups of four on the left and four on the right, even though it’s unclear to me what one would gain from that. And there’s the world in the background, Ernie’s Restaurant, a red truck, a bigger truck in the back, plus the bridges. One can try to take apart a good photograph and figure out how it operates, but it will still work afterwards. There are two bridges, a grey one running from the left to the right (or vice versa), plus a black one running from somewhere to the viewer’s immediate left towards a point we can’t see in the background. The grey bridge really just constitutes part of the background, whereas the black one visually connects the background with the foreground, meaning both the stage upon which the action is happening and where we, the viewers, find ourselves. The stage, in other words, might be a stage, but it really looks like a stage because of this photograph. Had we been there, we would have been a part of it, just as we are part of the world at any given moment. In any case, the viewer is located on a little stretch of road that runs into the road that divides the foreground and background. Now, whether or not you’ve found my way of describing the photograph successful or not, I do think it’s obvious that this photograph’s elements come together very successfully, both concerning the pictorial planes and the placement and interaction of the various proponents. The infrastructure dissects the image in all kinds of directions, connecting us to what we see, while at the same time reminding us how roads or trails usually tend to do just that: To go into all kinds of directions. The placement of the various actors allows the eye to remain in place, while going back and forth between the different groups. Crucially, the group in the back is doing exactly what we’re doing — watching the scene. The world is there to be watched, to be seen; and a good photographer will visually organize its content into pictures that make us see what we could but usually don’t see. And crucially, one can try to take apart a good photograph and figure out how it operates, but it will still work afterwards. In fact, one probably appreciates it even more. This is certainly what happened for me in the case of Riverfront. I will add this: Whether or not this photograph was staged or found (street-photography style) doesn’t matter for me at all. I suspect many people will disagree with me. The street-photo crowd will want this to be an example of their beloved games — as will the staging crowd. It’s too bad that both often are too dogmatic about how their images are made to realize how rich photographs can be when they’re made in a different way. Photographs that are “found” are not necessarily deeper than images that are made or constructed. To pretend the world is a richer place than what we could imagine makes the assumption that we are not of this world, that we are imperfect beings somewhat separate from it. We might be imperfect, but we’re part of the world. We are of this world, living in this world. The role of the photographer is to pretend that that’s not the case, while, at the same time, reminding us how futile that idea really is. Riverfront by Curran Hatleberg does this most successfully.